But joy is found at Baskin Robbins! Remember this? Well, I devoted an entire post to the foods I miss from back home. But, I shamefully forgot one. A very important and delicious one. 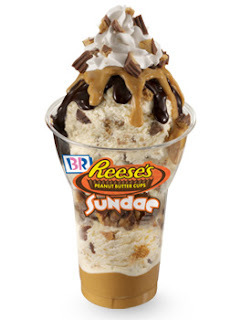 The Friendly's Reese's Peanut Butter Cup Sundae. Oh, how I have missed and mourned for this treat. Friendly's are only found on the east coast, have terrible food and even worse service, but have great ice cream. Every time we go home, I beg my husband to suffer the terrible service so that I can enjoy my all time favorite sundae. So, what's so great about this sundae? It's vanilla ice cream, peanut butter topping, hot fudge, a mound of whipped cream, sprinkles, a cherry, and topped with a Reese's Peanut Butter cup! And, I had just never found anything like it here in the land of Robins and Apple Blossoms. Thank you, Mr. Baskin. Thank you, Mr. Robbins. My hips will never be the same again. LOL. What is it about that peanut butter topping that is so addicting?! I'm not a huge pb fan, but I love those sundaes also. I'm glad you were able to find a good substitute! An extra walk around the block? Does that make up for it? Hehe! Oh how I miss chocolate peanut butter deliciousness! I totally remember Friendly's. Do you realize that they do have them in Ohio? There used to be one in Toledo and I think it's still there. My mouth is now totally watering... I will just have to live vicariously through you! oh yummy! so glad you found a substitute for your favorite treat. Too funny! That was a hoot-----we had Baskin Robbins last night after Sushi. Although here in Japan they call it "31". Oh my! That looks divine! Glad you found your long lost treat again! I know you two will have a long long future together! sounds delicious! I love peanut butter and chocolate together! Thanks. I just gained five pounds reading this post. No Friendly's? How did you do it? I think our Friendly's has pretty good service - although I could do without the balloons dangling above our heads!! 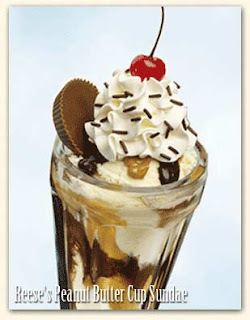 I think I need to get to Friendly's soon - yum!! I want that Friendly's sundae. I craved those sundaes especially when I was pregnant. I make Zak suffer through the bad service too! heehee! I think I am going to have to get one when we're in Balmer in a few weeks. yum! There uses to be Friendly's in our area about 20 years ago, but they all went out. I liked them back then! to be honest, i don't understand how people like peanut butter and ice cream together. don loves it. i'd rather have caramel. Baskin Robbins on every corner is one plus of living in Korea. Although, in the land of not quite right, they tend to have flavors like "green tea." Not sure if I can get this sundae, but I will CERTAINLY try! Are you trying to torture me? That looks SOOOO good. I love anything peanut butter, especially when it is combined with chocolate. MUST TRY THAT SUNDAE!!! And I did. Well, not that one exactly, but I had a version of it last night at a Frozen Custard place here in town. And it was sooooooooooooooooo gooooooooood!